While Symphorce's heavy metal path has been one of uneven acceptance and acclaim, founder Andy Franck (also Brainstorm) and longtime co-conspirator guitarist Cedric 'Cede' Dupont have pressed on. With their seventh album Unrestricted, Symphorce may catapult themselves into greater visibility. Unrestricted is quite possibly their best and most accessible album to date. Symphorce, by Franck's vision, has always been long on the power and melodic side of heavy metal, with rich doses of the progressive. All this remains, but on Unrestricted it's enveloped in what one can only describe as a profoundly 'catchy' groove. Until It's Over, Sorrow in Our Hearts, Do You Ever Wonder, and near radio-friendly The Waking Hour are a bewitching blend of heaviness and melody founded in rich vocal arrangements, uncommon guitar work, and diverse arrangements. Yet, Symphorce can still be forceful, leaning to the pure power heavy metal side, with The Last Decision. Engaging clever (but not weird) synths and guitar synths, creative vocal arrangements, and unconventional and unexpected arrangements for power metal make Unrestricted compelling and even more 'modern' sounding. 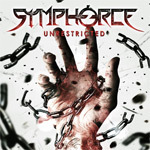 With their seventh album Unrestricted, Symphorce delivers their best, most accessible and entertaining, album to date. This album offers a different twist on Symphorce's well-known melodic power metal. Unrestricted certainly lives up to its name. Strongly recommended. With their seventh album Unrestricted, Symphorce delivers their best, most accessible and entertaining, album to date. Unrestricted offers a different twist on Symphorce's well-known melodic power metal.